I’m working with my engineering representative to modify a TC aircraft to replace a 28V Gill flooded battery with a pair of 12V Odyssey AGM in a different location. The new location while not “sealed”, is not provided with ventilation to the outside. After conversation with Odyssey and after reading their and other technical material I am happy to argue that the only “probable” malfunction in the charging system or battery installation that could result in a release of a hazardous quantity of gas would be a prolonged over-voltage event (>30V for the two batteries in series). That would release some quantity of hydrogen. The aircraft charging system is based on a Bosch 28V automotive alternator; I don’t have any technical details of whether it has any inbuilt over-voltage protection. The Approved Flight Manual indicates that an over-voltage condition has to be noticed by the pilot and pilot action is required to take the alternator off-line manually by pulling the c/b. So it’s probable there’s no automatic protection included. To demonstrate that I’m compliant with 23.1353(d) I’m thinking of including in the modification the installation of a crowbar protection module on the alternator field coil. So… to get to the question… can anyone suggest a part number/supplier for a 28V OV module (30V trigger voltage)? Ideally one that is already in use on a TC airplane somewhere, which will make it easier to have that part approved as part of the modification. Or are there any other ways I could provide comfort with respect to 23.1353? Search Aircraft Spruce for "over voltage". You could also check with B&C to see if this one includes OV protection. battery contactor was inside the box too. battery box and blew it up. nothing to do with venting of gasses. or burn even if you ARE a smoker. considers ONLY one failure at a time. out to the rest of the system. 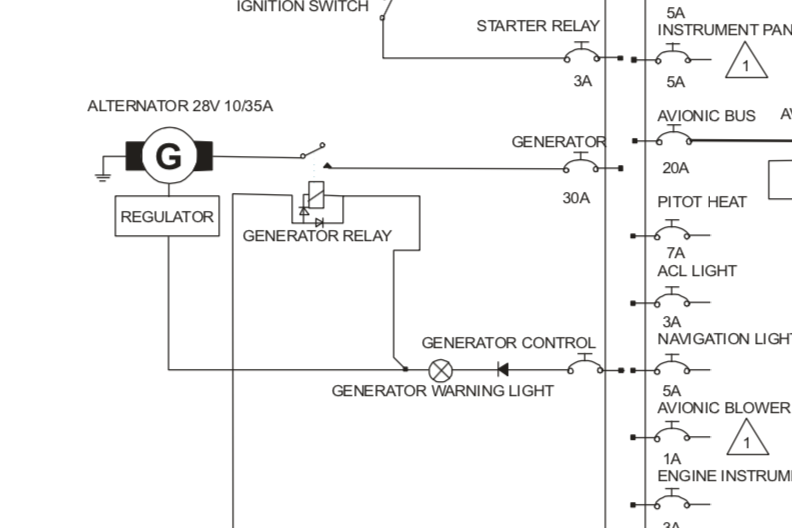 So� to get to the question� can anyone suggest a part number/supplier for a 28V OV module (30V trigger voltage)? Ideally one that is already in use on a TC airplane somewhere, which will make it easier to have that part approved as part of the modification. of any other components on the aircraft. It is (they are) going to be located under the seat. The airframe is composite, and the seat frame is part of the airframe, forming a well, but the seat top doesn’t seal tight, so let’s assume that that the seat void is adequately ventilated for lighter-than-air gas to the rest of the cabin. Being a modern airframe, the cabin is relatively leak and draught free. The bubble canopy seals well with a rubber cushion all the way around. When the cabin ventilation system is shut off, there are no draughts. The lower explosive limit for Hydrogen is 4%. Taking a factor of 4 safety, and assuming a cabin volume of 3m^3, a hazardous amount of H2 is 30 litres. Outgassing from all lead acid batteries during a significant over voltage event is 7.6ml H2 / cell / amp / minute. RG technology works great to reduce outgassing at low charge rates but isn’t a lot of use at high currents. The alternator is fitted with a 30A breaker. The worst case continuous release of hydrogen would occur when the alternator produces a voltage sufficient to charge the already-charged battery with a current of exactly 30A. Any more and the breaker will trip. There are 12 cells between the two batteries. That means that the worst case production of H2 is 2.7 litres / minute. A hazardous environment would follow, for regulatory purposes, in approximately 10-15 minutes, assuming no ventilation. I am *not* permitted to assume that the pilot will take the appropriate corrective action within that period and shut down the alternator. If I want to claim that the level of cabin ventilation is guaranteed to vent hydrogen at a rate sufficient to prevent buildup of 30l of H2 in that sort of time frame, I will have to justify that with adequate data. Alternatively if there is an over-voltage trip that prevents the bus voltage rising above 32V, then the battery would have to be limiting the overcharging current to less than 4A. The time to a hazardous buildup of H2 in the cabin would be 7.5 times greater, or more than one hour. Another way to satisfy regulatory requirement is to use a Concorde RG-11M that has a manifold and a vent tube. I can connect the vent tube to the original vent provided for the flooded battery, and the requirement is satisfied because all gas will vent to the outside. The disadvantages are that it’s a lot more expensive than two odyssey batteries. And at 27lbs, harder to mount. There is merit in this idea, but I am concerned about project creep. To the extent that the existing IR alternator passed certification, it’s not an absolute requirement to upgrade it. Iâm working with my engineering representative to modify a TC aircraft to replace a 28V Gill flooded battery with a pair of 12V Odyssey AGM in a different location. The new location while not âsealedâ, is not provided with ventilation to the outside. After conversation with Odyssey and after reading their and other technical material I am happy to argue that the only âprobableâ malfunction in the charging system or battery installation that could result in a release of a hazardous quantity of gas would be a prolonged over-voltage event (>30V for the two batteries in series). That would release some quantity of hydrogen. The aircraft charging system is based on a Bosch 28V automotive alternator; I donât have any technical details of whether it has any inbuilt over-voltage protection. The Approved Flight Manual indicates that an over-voltage condition has to be noticed by the pilot and pilot action is required to take the alternator off-line manually by pulling the c/b. So itâs probable thereâs no automatic protection included. To demonstrate that Iâm compliant with 23.1353(d) Iâm thinking of including in the modification the installation of a crowbar protection module on the alternator field coil. > can anyone suggest a part number/supplier for a 28V OV module (30V trigger voltage)? Ideally one that is already in use on a TC airplane somewhere, which will make it easier to have that part approved as part of the modification. How about a low tech solution? Add a small vent from the well to the outside of the fuselage so that, whenever the airplane is in motion, low pressure on the outside draws air past the seat top, past the batteries, and out. I love low-tech! I don’t think that’s definitive enough for the powers that be, however. And… I don’t think my structures person will enjoy me drilling holes in a composite stressed fuselage just for a look see. On the subject of over-voltage trips, I have discovered that both Carling and Sensata (Klixon) make circuit breakers with, for instance, a second coil that you can use to trip the breaker via an isolated circuit (that could easily be triggered by an over-voltage, in addition to the regular over-current coil. So one of those could be used to replace the b-lead CB. It will be a challenge to find small quantities of what is a very specialized part though. that are fed from the battery . . .
a design goal is to minimize the water it contains. fingers, you would be unable to produce liquid. intended to limit the amount of retained water. MECHANICALLY robust container is called for. ability to abuse the battery. for an ov management system to operate. the smell that managed to get forward. I love low-tech! I don’t think that’s definitive enough for the powers that be, however. And� I don’t think my structures person will enjoy me drilling holes in a composite stressed fuselage just for a look see. didn't ring their bells either. own vent plumbing to most batteries. cap . . . E6000 would be good. The collection of pictures at . . . I'll keep digging in the library . . .
That’s a possibility… I already have an overboard vent from the original installation of the (flooded) Gill battery. If I go the $$$ route and install the Concorde RG version it has a manifold I was planning to run a tube to it. Do you have any data about what happened to that Odyssey? > It is (they are) going to be located under the seat. The airframe is composite, and the seat frame is part of the airframe, forming a well, but the seat top doesnât seal tight, so letâs assume that that the seat void is adequately ventilated for lighter-than-air gas to the rest of the cabin. Being a modern airframe, the cabin is relatively leak and draught free. The bubble canopy seals well with a rubber cushion all the way around. When the cabin ventilation system is shut off, there are no draughts. Slightly off topic, but relevant to this thread, composite structures are very tolerant of small holes. Some airframes have reinforcing belts (uni-directional fibres, say 3" wide), as long as those are avoided a small hole for a vent pipe should be no problem from the structural perspective. Drag or aesthetically wise it may be a different story, but don't assume a composite structure behaves the same as metal! "23.1351(c)(5) Each generator must have an over-voltage control designed and installed to prevent damage to the electrical system, or to equipment supplied by the electrical system, that could result if that generator were to develop an over-voltage condition." Bill - you must have first hand knowledge of the introduction of this rule, am I right? I donât think my structures person will enjoy me drilling holes in a composite stressed fuselage just for a look see. On the subject of over-voltage trips, I have discovered that both Carling and Sensata (Klixon) make circuit breakers with, for instance, a second coil that you can use to trip the breaker via an isolated circuit (that could easily be triggered by an over-voltage, in addition to the regular over-current coil. So one of those could be used to replace the b-lead CB. It will be a challenge to find small quantities of what is a very specialized part though. I proposed an ov protection system that was based on the external trip feature for some magnetic breakers . . . I think it was for Swearingen Aircraft. The cost-benefit ratio didn't ring their bells either. Further, doing ov protection in the B-lead is less than optimum. That's a VERY HIGH ENERGY switching event that would continue to produce voltage and ultimately destroy the alternator too. Opening the field circuit has been the legacy approach since the first generators were strapped to aircraft engines. Bob . . .
design that I shared with my former colleagues. that features self-contained ov protection. Here's one set of examples . . .